This entry was posted in Club Championship and tagged 2017/18, Club Championship on 09/18/2017 by georgehollands. A rather peculiar thing to claim, particularly since on the very next page Evans writes “[Bobby] Fischer told friends he was surprised that Karpov beat Polugayevsky”. This entry was posted in Quotes and tagged Evans, Fishcher, Karpov, Polugayevsky on 03/02/2016 by georgehollands. A few days ago the post Study Time – Jan 2016 presented a neat little 4 move study. This entry was posted in Study Time and tagged Afansiev, Duizov, Endgame Study on 02/08/2016 by georgehollands. Endgame studies are an excellent way to train one’s calculation. Set the following position up on a board and try to solve by yourself, without any engine assistance. It’s a short little study, the solution is four moves long. This entry was posted in Study Time and tagged Afansiev, Duizov, Endgame Study on 02/01/2016 by georgehollands. 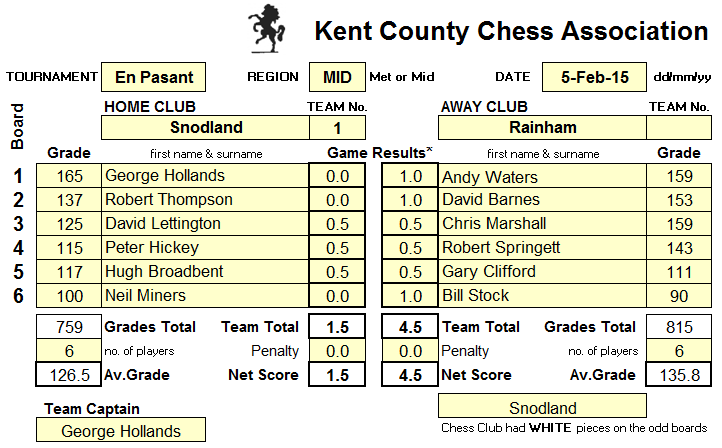 This year saw the 6th edition of the Len Hammond Memorial, the annual friendly match between Snodland and local rivals Maidstone. Len was an active and well liked member of both clubs and is fondly remembered. Match results below. This entry was posted in Len Hammond and tagged David Fowler, David Lettington, Friendly, George Hollands, Len Hammond, Maidstone, Matt Bunn, Neil Miners, Peter Hickey, Richard Mallery, Robert Thompson, Snodland on 09/24/2015 by georgehollands. Snodland have played three recent matches, including a 4-0 win against Maidstone in the Tom Fuller. A draw and a loss in the En-Passant competition took some shine off our previous four wins in this league but should see us qualify for the business end of this year’s competition, the semi finals. 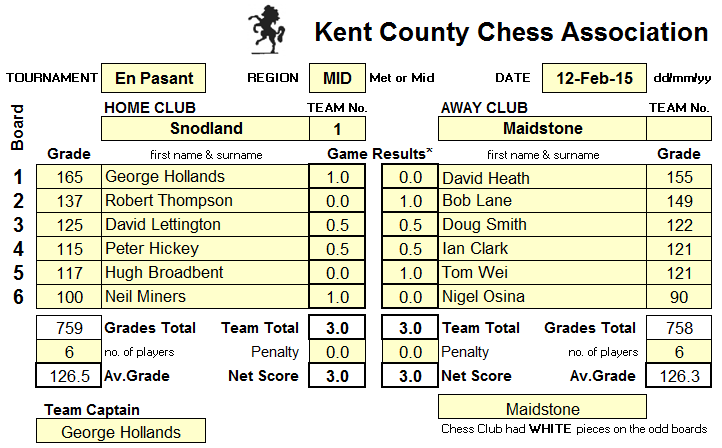 This entry was posted in En Passant, Tom Fuller and tagged 2014/15, David Lettington, George Hollands, Hugh Broadbent, Maidstone, Matt Thompson, Neil Miners, Peter Hickey, Results, Robert Thompson, Tom Fuller on 02/15/2015 by georgehollands.